I love a good series. There’s something about a set of anything that coordinates that gets my attention. The Coffee Sleeve of the Month series I finished up last spring was so much fun for me. It’s generally a healthy obsession…generally. If, for instance, a fabric pattern comes in twelve colors and I own eleven of them I will never sleep again. Rather than dwell on my personality disorders, lets talk about the new series I’m starting today! This idea started, like many of mine do, with a page full of scribbling. I wanted to make a mug-shaped hot pad, but soon my page was filled with other hot pads using the same shape as the cup, but with entirely different themes. Then I wrote months next to the seasonal shapes, and pretty soon I had a calendar full – and then some. I can’t wait to show you all of them, but for now, let’s talk about how to make that mug. 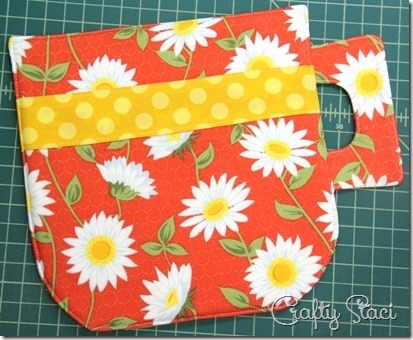 You’ll need this pattern, pieced together using the dotted line to match up the two sides. You could cut the handle from one side before taping them together so you don’t have to trace it into another piece of paper. 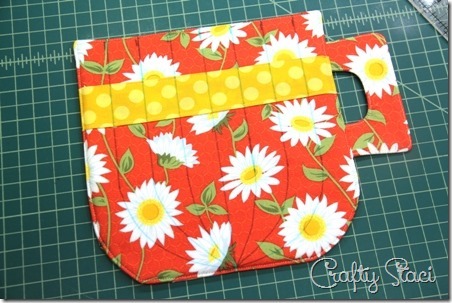 Cut two of the mug and handle from cotton fabric, one of each from Insul-Bright and one of just the mug from cotton or cotton blend batting. If you’d like the accent strip you’ll need to cut a cotton fabric strip 2” by 8 1/2”. Fold the long edges of the accent strip under 1/4” on each side and press. Pin it in place on the front of the mug, 2” from the top edge. Stitch along both edges. To assemble the handle, layer the pieces with the Insul-Bright first, with the two fabric pieces on top, right sides together. Stitch around the outer and inner curves, 1/4” from the edge. Leave the two short edges open. Clip the curves. 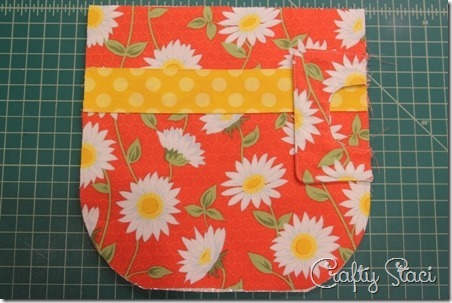 Pin a safety pin to the seam. Push the pin into the handle. Lead the pin all the way through and out the other side to turn right side out. Press the seams. Top stitch close to the seams on both sides. To prepare the mug for stitching, lay the Insul-Bright out with the shinier side up. Lay the front mug, right side up, over that. Add the handle, with the loop to the inside and the top 1 1/2” from the top of the mug. Lay the back, face down, over the top. Add the batting, and carefully pin all the layers in place. Stitch around the outside edge, leaving a 3” opening at the bottom. Clip the corners and turn right side out. Press, turning in the opening. Stitch close to the edge all the way around the mug. You’ll want to add a bit of quilting to keep the layers from shifting. I went with lines coming from the top and converging at the bottom center of the mug. Knowing I couldn’t be consistent without some guidelines, I drew the lines on with a pen that can be erased with a bit of water. It was just a matter of stitching along those lines. You could go with straight lines if you’re more comfortable with that. These are really easy, and would make a fantastic housewarming gift! Are you ready for eleven other variations of this cute hot pad?